SETLIST: Hello; Hometown Glory; One and Only; Rumour Has It; Water Under The Bridge; I Miss You; Million Years Ago; Skyfall; Don’t You Remember; Send My Love; Make You Feel My Love; Sweetest Devotion; Chasing Pavements; Someone Like You; Set Fire To The Rain; All I Ask; When We Were Young; Rolling In The Deep. She’s arguably the world’s biggest pop star at the moment and could’ve easily played stadiums rather than arenas on this tour. The decision to restrict herself to venues of no more than 20,000, while infuriating those fans unable to get a ticket, means the pressure on Adele is reduced tonight on the sixth of her eight dates at this venue. This is probably just as well as Adele hasn’t toured since 2011 when she was forced to cancel her tour midway through because of throat problems. Yet she needn’t have worried. We’ve never yet seen an artist who seems so comfortable in what can feel like a gigantic, aircraft hangar of a venue. 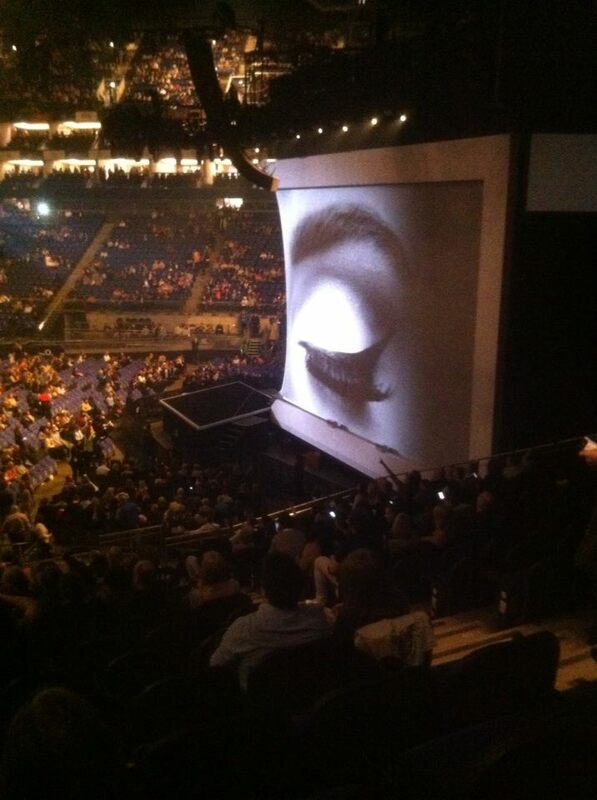 Perhaps it helped that the first we see of Adele is as she emerges on a rising stage in the middle of the arena. But much of this two-hour-plus show involves Adele bantering with the audience she hasn’t entertained for five years in the venue where her career caught fire with a BRITS performance of Someone Like You when she was 21. 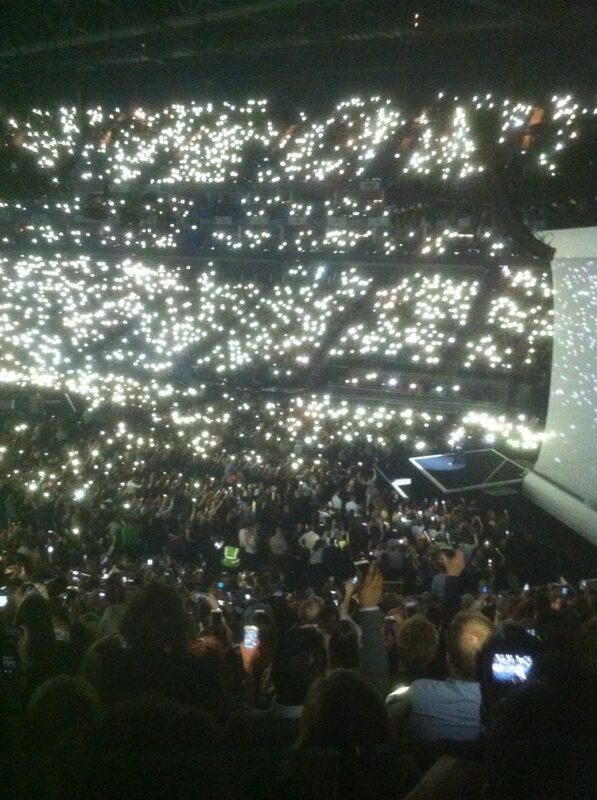 She dedicates Make You Feel My Love to Brussels and urges her fans to show their respect by turning on their cameraphone lights (above). ‘I don’t think I’ve ever actually been so moved before in my life at one of my shows, that was just so beautiful,’ she says afterwards. What’s remarkable here is that throaty voice, very X Factor winner in bombast but capable of gear shifting through blues and country, those heartfelt ballads she wrote which bare her soul as well as her normal woman shtick which is so disarming and endearing and would be impossible to fake over such a long period. She’s one of us which makes the moments when her songs catch fire (and they do noticeably during When We Were Young and Rolling In The Deep) all the more affecting. If we’ve one minor gripe, and that’s why we’re deducting a star, it would be because we’d like to see more uptempo material. Adele, that’s our Glastonbury challenge to you. We’ve every confidence you’re going to slay the biggest gig of your career so far on 25/6 but we’d love you to do it with more of a wiggle in your middle. And you twerked tonight after all. Picture via Facebook courtesy Adele. Tickets here.